High School [Classical studies] (Liceo Statale T.Tasso, Rome wiki). 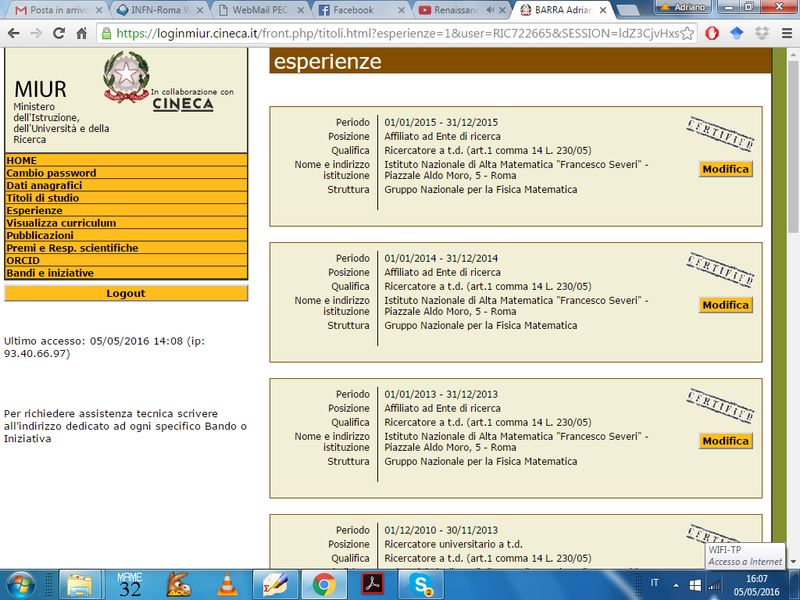 Laurea Degree in Physics [Theoretical] (Sapienza University of Rome, wiki). PhD in Mathematics [Applied] (King's College University of London, wiki). Post-doc 1 year [Mathematics Dept.] (Alma Mater Studiorum Bologna, wiki). Post-doc 3 years [Physics Dept.] 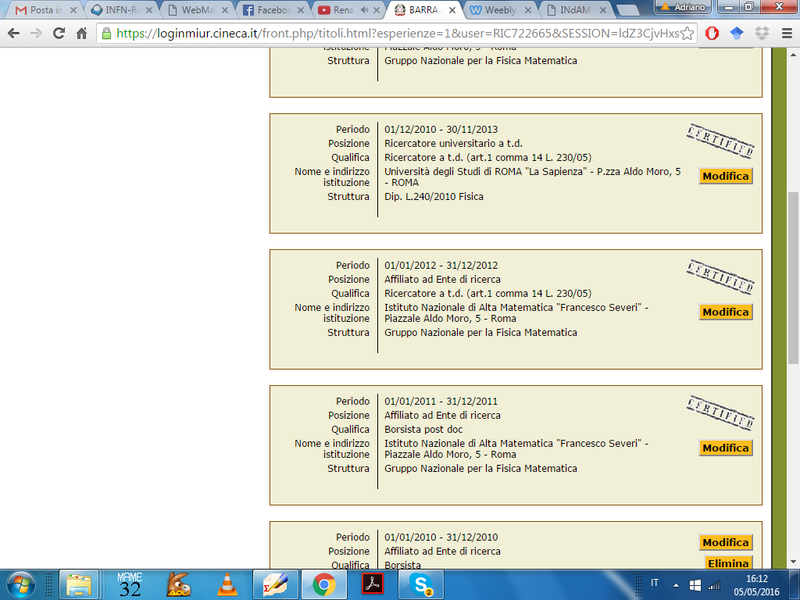 (Sapienza University of Rome). [Physics Dept., rtd-a FIS/02] (Sapienza University of Rome). Winner (3 times) of the "Progetto Giovani" by "National Group for Mathematical Physics"
Qualified as Associate Professor in Mathematical Physics. Qualified as Associate Professor in Theoretical Physics (Fundamental Interactions). Qualified as Associate Professor in Applied Physics (Biophysics). Author of roughly 80 Scientific Papers in the fields above (see "Specific interests"). 2018-Highlights of PRE (Physical Review E) of APS, (Editor's Choice for 2018) on our work on Artificial Intelligence 79@Publications: link to appear at the end of 2018. Dec-2018 Together with E. Agliari, P. Sollich & L. Zdeborova we will handle a special issue on statistical physics and machine learning at J.Phys.A: Submission open!!! Apr-2018 I've been elected "Elsevier Outstanding Referee" for the year 2017 for the Journal "Applied Soft Computing"
Mar-2018 I am one of the MIUR evaluation experts in the Reprise Evaluation Panel (for fundamental research, Rita Levi Montalcini fellowships). Mar-2018 I've been elected "Elsevier Outstanding Referee" for the year 2017 for the Journal "Neurocomputing"
Mar-2018 I am in the evaluation board in the Forschungszentrum Jülich for the award "Jülich Excellence Prize 2018"
Mar-2018 Our Friends from King's College are organizing this great conference on Math&Immunology. Nov-2017 Abilitato Professore Associato (II Fascia) in Fisica Applicata (Applied Physics). 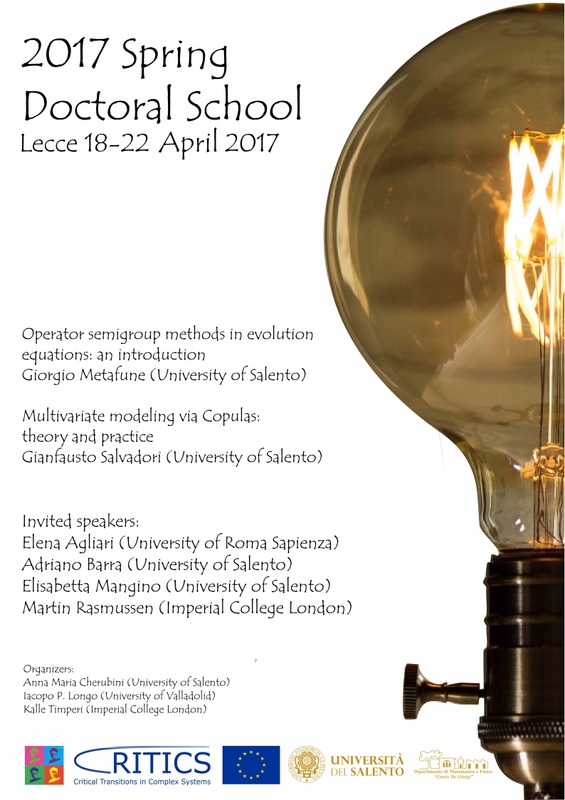 Jul-2017: I speak at the Julich Symposium "Stochastic dynamics in biophysical systems, neuronal networks and field theoretical approaches"
May-2017: I am a member of the Board (Collegio Dottorale) for the new Ph.D. in UniSalento: "Nanotechnology"
Apr-2016: I have been elected fellow of Institut d'ètudes avanceès IMèRA (Marseille) [final list: here there is one fellow per discipline] where I'll have the privilege to share work with Alain Barrat and Viktor Jirsa on Cibernetic Immunology. January 2016: "Almanacco delle Scienze" by C.N.R. has dedicated a page to our divulgative journal Scienze&Ricerche: link here. October-2015: our book Theory and Applications in Mathematical Physics is finally out at World Scientific: link here. August-2015: 1500 researchers in AI (me included) signed against "autonomous weapons". Here the Scientific American article, and here the original letter (and here the list of signers) -> no more AI techniques in weapons of mass destruction!!! Jun-2015: the highlights (best papers) for the year 2014 of JPA-IOP (Math & Theor Phys) are out! details here. Jun-2015: for the next two years I'll play in the Editorial Board of Nature Scientific Reports (section Chemical Physics & Artificial Intelligence). 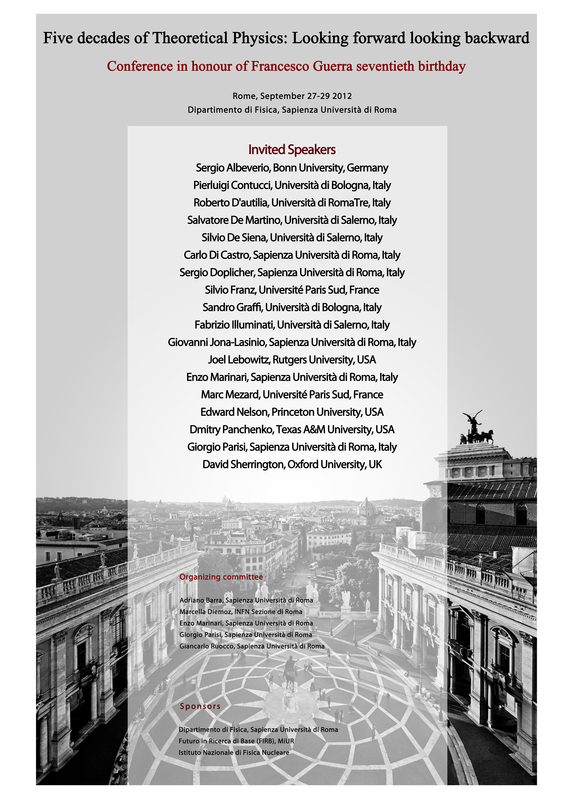 May-2015: I speak at Biophysics@Rome2015. Program and details ﻿here﻿. May-2015: the special issue of Journal of Theoretical Biology on Autoimmune Phenomena is finally out: link here. Remarkably our contribution (paper n.71 in my pubblication list, namely "Anergy in self-directed B cells from a statistical mechanics perspective" has been judged as "all the more interesting paper" in the preface of the book (available here), wrote by Prof. Root Berenstein. 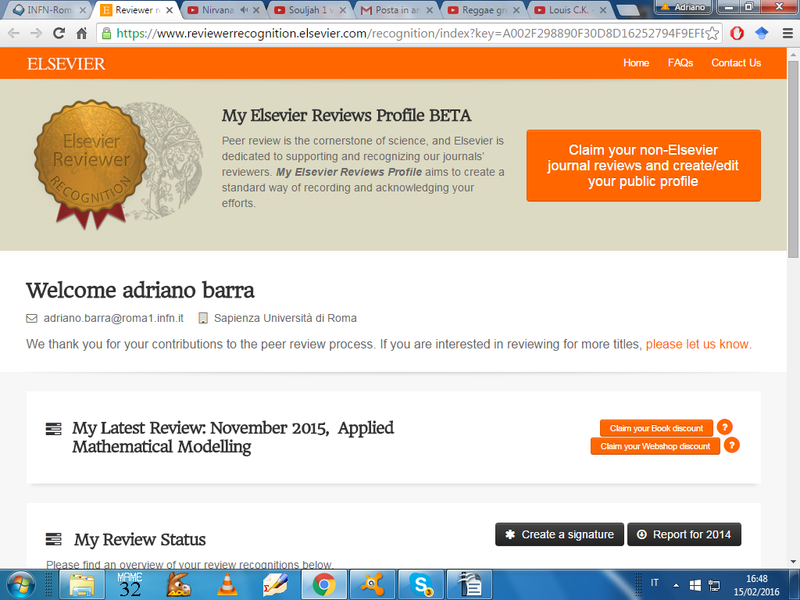 Mar-2015: My (very partial) profile is avaiable on Academia.edu now. Mar-2015: I accepted to be in the Editorial Board (panel di Fisica) of the divulgative journal Scienze&Ricerche. Mar-2015: Elena Agliari (one of my most frequent collaborator) has her new website here. Feb-2015: Biological Cybernetics has now two major contributions on Nature Scientific Reports, see publications 68 and 52. Feb-2015: the next number of Europhysics News, issue 46/2 (link here, pag.7 -or 9, depends on browsers-), dedicates an "highlights article" to progresses made in Neural Networks thanks to our approaches (see the letters PRL2013 and PRL2015 or the long paper where the whole theory is exposed here). Jan-2015: Our paper "Metastable states in the hierarchical Dyson model drive parallel processing in the Hierarchical Hopfield network" will appear also in the 2014-IOP-Select. Jan-2015: I will be in France (Marseille & Paris) within the trimester at Institute Henrì Poincarè "Disordered systems, random spatial processes and some applications" and present our novel results on Quantitative Sociology and Economical Complexity. Our work on hierarchical neural networks has been selected for the cover of JPhysA (Vol.48 Iss. 1): here. In the month of December 2014 I am Invited Professor at IMERA to held the course "Modeling the Response of the Adaptive Immune System" for PhDs and researchers. In the month of November 2014 I am visiting Sao Paulo University (Brazil) at the Stochastic Modeling Center (from the November Conference, where I will present our novel results on multitasking neural networks, see PRL2012). 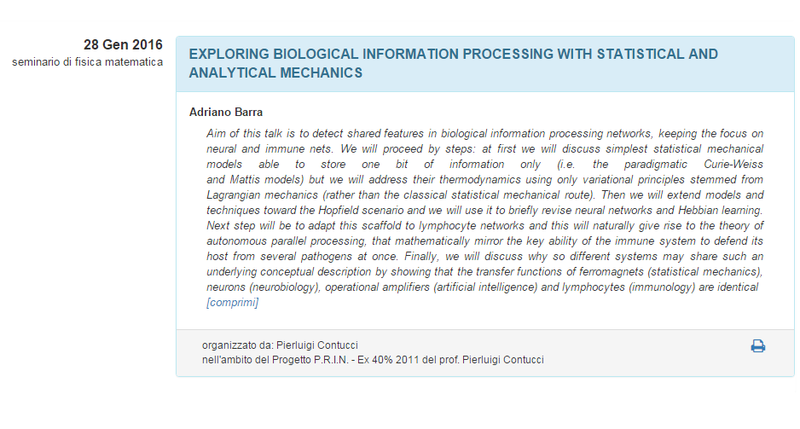 May-2014: I have been invited to play as opener at the conference "Biophysics@Rome2014": details here. IOP dedicated an Insight report on our work regarding Immune Networks to better trigger physicist's and mathematician's curiosity.